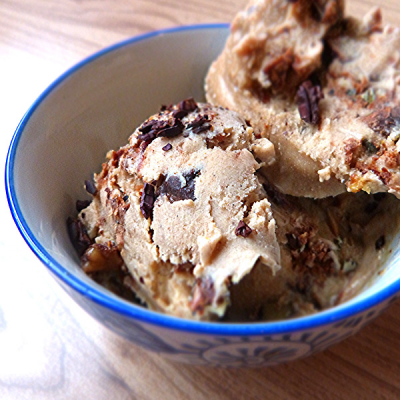 Creamy Christmas Dessert Ice Cream with intense Medjoul dates, mild almond, spicy cinnamon and Lifefood Granola Cookie. Creamy Christmas Dessert ice cream with crunchy cookie bites! Mix dates, banana, almond paste and coconut oil with a little water to a creamy mass. Season your ice cream with vanilla and cinnamon as you like. 1) With half a tsp of vanilla powder and a pinch of cinnamon your ice cream becomes really christmassy and a perfect dessert for the holidays! In the next step you chop Lifefood Granola Cookie roughly and mix the crunchy cookie pieces by hand in your ice cream. Now make your ice cream freeze! Put it in the freezer overnight. Once the ice cream is frozen, portioned it by spoon and sprinkle your Christmas dessert with cocoa nibs. Enjoy every moment. Made with love. 2) Try varying your Christmas dessert with Lifefood other delicious products! How about chopped cocoa beans instead of Lifefood Granola Cookie, walnuts or Lifefood tangy raspberry chocolate?